Make this spectacular tote to carry your treasures in. The roomy central keep also has four flat walled pockets, two on both front and back. The side roofed towers are pockets of insulated batting that will hold baby bottles, knitting needles, folding umbrellas, water bottles, etc. Windows and doors may be personalized by using photos printed on fabric. 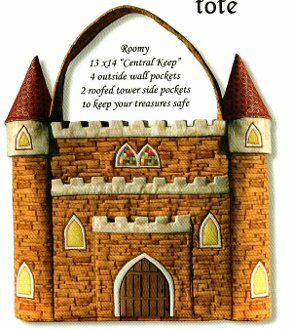 Include your own family members waving from castle windows.